We are delighted to tell you that the Canadian Law Blog Awards has named Dentons Canada’s Occupational Health and Safety Law blog as one of the best legal practice group blogs in Canada in 2017. The Canadian Law Blog Awards states, “Each year we select three practice dedicated blogs from larger law firms that deliver helpful commentary on a select business industry or legal challenge. Here are the publications that stood out in 2017” – and ours was one of the three. We pride ourselves on bringing you timely updates on health and safety caselaw and other developments in Canada, and we plan to continue doing so in 2018. Thank you for your support of this blog, and please keep reading! If you think we should cover any particular topics or cases in our blog posts in 2018, just let us know. We are always happy to hear from our readers. The Ontario government has introduced legislation that seeks to, among other things, provide for the establishment of employer “health and safety management systems” under the Occupational Health and Safety Act. Require the CPO to publish the standards for accreditation of health and safety management systems and the criteria for recognition of employers promptly after establishing or amending them. Bill 70 received 2nd reading on December 1, 2016. Stay tuned for further developments. The bill, which also contains amendments to a number of other statutes, may be accessed here. The Ontario government has passed amendments under the Occupational Health and Safety Act which provide new technical and operational safety measures and procedures for rotary foundation drill rigs, and require that drill rig operators be trained and certified. The amendments containing the new drill rig requirements, which have been passed in regulation, will come into effect on July 1, 2016 to allow time for the construction industry to comply. The Ministry of Labour states in its press release that rotary foundation drill rigs are used for boring holes in soil in order to install foundations or earth retention structures. Ontario is the only jurisdiction in Canada to implement explicit training requirements for drill rig operators in its health and safety legislation. The Ministry states in its press release that these changes are intended to build on actions that the province is already taking to improve safety for construction workers, including the Working at Heights Training requirements (read our article about this training here). The Ministry says that Ontario’s construction industry has traditionally experienced higher rates of workplace injuries and fatalities than other workplace sectors, and that there were 200 critical injuries in construction last year and 21 fatalities. The Ministry of Labour’s press release announcing the changes can be found here. An interest arbitration board has imposed a 24-hour shift for firefighters employed by the Ontario City of St. Catharines, despite the city’s strenuous objections based largely on safety concerns. The City and firefighters’ union had resolved all terms of their collective agreement except whether there should be 24-hour shifts and one other issue. The union wanted the 24-hour shifts and the City wished to maintain its current shift schedule (10 hour day shifts and 14 hour night shifts). The City called an expert on sleep medicine and disorders. The expert focused on the dangers of sleep deprivation and fatigue. His opinion was that the current “10/14” shift schedule was substantially safer than a 24-hour schedule. The evidence, however, was that over 82% of firefighters in Ontario, from “services of all sizes”, have “adopted and/or adapted to the 24-hour shift”, and 70% of firefighters in the United States. A number of other Ontario cities, including Toronto, used 24-hour shifts which had been “freely bargained”. The arbitration board noted that the expert’s evidence was largely based on the experience of other professions such as medical interns, who often got very little sleep during their 24-hour shift. In contrast, firefighters in St. Catharines had gotten uninterrupted sleep during 80% of their night shifts. Further, the evidence suggested that it would be rare that a firefighter would not get any sleep during a 24-hour shift. There was also no evidence of any allegations that the 24-hour shift was a cause or contributing factor in any harm occurring, “even in the litigious U.S.A.” Further, the Ontario Fire Prevention and Protection Act permitted 24-hour shifts, suggesting that the Legislature has accepted that the 24-hour shift did not present undue health and safety risks. In summary, the evidence did not establish that there was an unacceptable safety risk to anyone that could not be addressed if a 24-hour shift was implemented. Given the principles of “replication and comparability”, and given the wide use of the 24-hour shift in other cities, the arbitration board ordered the parties to convene a “joint committee” to “determine the best formulation” for the implementation of a 24-hour shift for a two-year trial period. We are particularly delighted to welcome our special guest speakers The Honourable K. Kellie Leitch, P.C., M.P., Minister of Labour and Minister of Status of Women, and Chantal Bernier, former Interim Privacy Commissioner of Canada. Registration and breakfast: 8:30-9:00 a.m. Welcome remarks and special guest speaker Chantal Bernier: 9:00-9:30 a.m. Lunch and special guest speaker Scott Armstrong: 11:45 a.m.
For more information and to RSVP for this event visit our registration page. 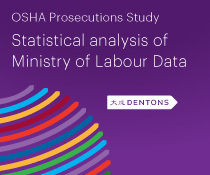 Please contact toronto.events@dentons.com for any questions. A constructor that argued the “mistake of fact” due diligence defence was instead found to have made a “mistake of law” and was convicted of a charge under the Occupational Health and Safety Act. A construction employee was injured when a large slab of ice fell from the face wall of a water intake tunnel being constructed. A few minutes before, workmen suspended by a crane in a basket had been chipping away ice from that area. The constructor was charged with three offences under the Occupational Health and Safety Act. The second charge, which the Ministry of Labour inspector admitted alleged “technical” safety violations that played no role in the accident, alleged that the constructor failed to ensure that a load rating chart, prepared by a professional engineer, was affixed in a conspicuous place on the crane. The crane operator admitted that he was “still waiting” to receive the load rating chart from the professional engineer. As such, the appeal court found that the constructor guilty on the second charge. The constructor argued the “mistake of fact” branch of the due diligence defence. It argued that there was a rating chart at the base of a removable plywood platform (that is, at the workers’ feet) that was a suitable “variation” on the legal requirement. It also purported to rely on a “comfort” letter from an engineering firm. The appeal court held, however, that any mistakes the constructor made were “mistakes of law not fact”: the variations were not permissible because the employer had not given written notice to the joint health and safety committee, and the engineering firm’s letter did not refer to the regulation and could not, in any event, displace the requirements of the regulation. A mistake of law is not a defence. As such, the constructor was convicted on the rating chart charge. Two other charges against the constructor were dismissed. You will have noticed that the look of this occupational health and safety law blog has changed – a lot! 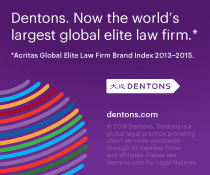 We are delighted to announce our new global law firm, Dentons. And much more than our firm colours has changed. We are now working together with 2,500 talented lawyers and professionals -including many occupational health and safety lawyers – in 79 locations in 52 countries across Africa, Asia Pacific, Canada, Central Asia, Europe, the Middle East, Russia and the CIS, the UK and the US. Please see Introducing Dentons for an overview of our new firm. We recently reported that Metron Construction had pleaded guilty to criminal negligence in respect of the Christmas Eve 2009 deaths of four workers who fell 13 floors when a suspended work platform collapsed. On Friday, July 13th, the court imposed a historic fine of $200,000 on Metron Construction in relation to that guilty plea. The prosecutor had requested a fine of $1 million against Metron. The court also imposed a fine of $90,000 on Joel Swartz, an owner of Metron Construction, for four offences under the Ontario Occupational Health and Safety Act. The fine against Schwartz is 90% of the maximum fine for individuals. A Victim Fine Surcharge was added to all fines. The Toronto Star reported that Metron Construction admitted, in an agreed statement of facts put before the court, that the site supervisor, who was one of the four workers who died, had directed the workers to the scaffold knowing that only two lifelines were available; that the site supervisor permitted employees under the influence of drugs to work on the project; that toxicology analysis showed that three of the four workers who died, including the site supervisor, had marijuana in their systems from recent ingestion; and that the scaffold was improperly designed and had defective welding. The Toronto Star also reported that the fines met with “outrage” from the president of the Ontario Federation of Labour. Union leaders have been calling for stronger enforcement of criminal safety provisions that came into force in 2004 under what is known as Bill C-45. The Ministry of Labour notes that other defendants facing charges stemming from this incident are still before the court. The Ontario Ministry of Labour’s press release can be accessed here. An Ontario labour arbitrator has reinstated a dismissed employee after the employer improperly relied on previous discipline and also failed to prove that the employee had threatened a manager with a shovel. The employer had violated a previous settlement by failing to remove previous discipline from the employee’s record and then relying on that discipline in its dismissal of the employee after the shovel incident. For that reason alone, the termination was “null and void”. Although in this case the arbitrator found that the employee had not threatened with the shovel, this decision demonstrates the importance of following appropriate process and showing care in preparation of the termination letter. Even a strong dismissal case can be lost where, as here, the employer violated the collective agreement by attempting to rely on outdated or “sunsetted” discipline to bolster its workplace-violence dismissal case. A mining worker’s exposure to asbestos did not cause his colon cancer, the Ontario Workplace Safety and Insurance Appeals Tribunal has held. The worker worked for a “nickel producer” for approximately 38 years from 1959 to 1997, first in a mill, then in a smelter, and then in maintenance and construction. Less than 3 years after he retired, he was diagnosed with colon cancer. The WSIAT found that although the worker had been exposed to asbestos, the exposure was not of a “continuous and repetitive nature” or a “major component” of his work. The WSIAT also accepted the evidence of a specialist in occupational medicine that the medical literature overwhelmingly supports the statement that colon cancer is not related to asbestos exposure, and that there was no evidence of a relationship between the worker’s exposure and his colon cancer.